As she nears her home, she sees a man in a torn shirt on the side of the road with car trouble. He stares at her with a sinister expression, perhaps because she did not stop to help, or even slow down. The woman, Alexandra Jung, drives off, but we see the man open his trunk, revealing his collection of bloody body parts. Perhaps it is fortunate our heroine did not stop to help the man. A man who appears to be an Old West prospector picks up the ripped-shirted man in his pickup. “Probably just your thermostat got stuck,” he offers, trying to explain why the man’s car broke down. As in many fine movies, the ripped-shirted man shows questionable judgment by murdering the driver of the vehicle in which he is riding. As usual, the murderer comes to no harm. Next, we watch a couple making out on a couch, unaware they are being stalked by two masked men, one wearing a Freddie Krueger bladed glove and the other carrying a shotgun. The perceptive audience members familiar with the beats of modern horror movies have already guessed that these stalkers are mere pranksters, but we watch as they kick open the door and threaten the couple with violence. The couple reacts quickly—in fact, they do not even look at the invaders, saying “Don’t shoot” even before they have seen a gun. The stalkers have a good guffaw at the expense of their friends. “One of these days, your jokes are gonna go a little too far, Ty,” says the woman, implying the threat-of-murder joke has not gone too far tonight. After such a big scare, the boyfriend—played by Kato Kaelin—and one of the pranksters invade the refrigerator and within seconds have buried their faces in a cream pie with alacrity to rival that of Gilligan himself. They then proceed to perform a comedy routine that I must confess I do not fully understand in which they remove from the fridge a Preparation H container, a box of Ex-Lax, and finally a pregnancy test. The young woman kicks the three ne’er-do-wells out of her house, though unfortunately the front door falls off its hinges as she does so. 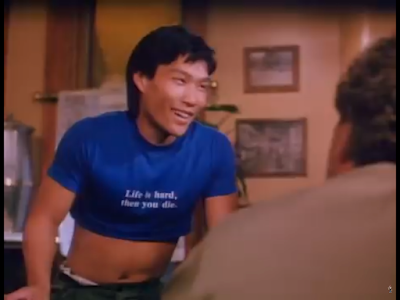 One of the troublemakers—played by Stuart Quan, a prolific actor who tragically died at the age of 46—meets newswoman Alexandra at a tiny restaurant in downtown Danford. It turns out they are brother and sister. Notably, the brother wears much less clothing than his sister. As she pours creamer into her coffee from a bottle with a cow’s head on top, Alexandra says, “Every time I use one of these things I feel like it’s puking in my coffee.” Then she confides in her brother that she is worried about finding success as a TV newswoman in Los Angeles. She also orders a steak, rare. She turns her head to look at the restaurant bar and, shockingly, she sees the scruffy hitchhiker from earlier. 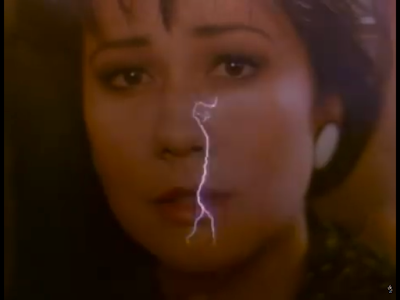 The filmmakers dissolve from his face to Alexandra’s face, superimposing a violent electrical storm. Clearly there is some connection between the two characters. The “electric” moment is interrupted by local sheriff Adam, who takes a seat at Alexandra’s table. They trade witticisms: “According to Alta, you’re on your way to the top of the network,” says Adam. “Don’t you?” asks the policeman. Then he tells her a humorous story about a woman crashing into a power pole, resulting in a bloody gouge “over her head,” and a dog choking to death on a dog biscuit. The entire restaurant scene, clearly comedic in nature based on context clues, comes to a head when her waitress pours Alexandra a glass of water using a pitcher shaped like a dog’s head. Meanwhile, Adam is called away on police business, as a body has been found in a dumpster. The scene is attended by a handful of medical professionals in surgical scrubs. The witness responds in the negative. The surgical team pulls bloody chunks out of the dumpster, one at a time. Alexandra and her brother return home, which in her family’s case is the King’s Rest Motel, run by Alexandra’s godmother Alta. 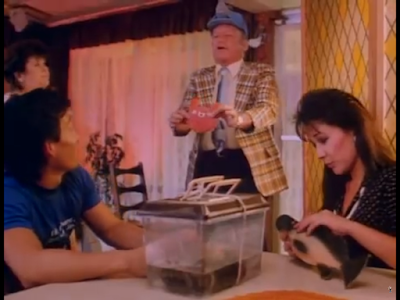 Alta introduces Alexandra to Gene Krebelski, an elderly traveling salesman played by the legendary Aldo Ray. Mr. Ray sells novelty items that are all fish-related, such as something called a “squid scraper,” which appears to be an ordinary squeegee. Later, Alexandra has a dream set in a gothic castle in which her brother has fangs and eats a human hand. “Want some?” he asks her. Alexandra wakes up calmly, in a subversion of horror movie cliches, though she soon receives a call from her boss at the LA TV station asking her to cover a press conference in her hometown. First, however, she must notify her brother, who lives in Room 3 of the motel, that breakfast is ready. She also takes the opportunity to help her kickboxing brother get dressed in a t-shirt even skimpier than the one he wore the previous night—an outfit he wears while performing handyman duties at the motel. The press conference turns out to be a panel discussion in the city council chambers in which the coroner explains all the details of the case, occasionally consulting with Sheriff Adam. Only three reporters, including Alexandra, are present; the chamber is otherwise filled with townspeople who ask more questions than the reporters. The crowd files calmly out of city hall. “Adam,” says Alta, “in the mood they’re in, I’m more frightened of that crowd than I am that killer.” Her reference is unclear, however, because the “crowd” of townspeople appears calm and not agitated at all, and they disperse in an orderly fashion into the local park. At a nice outdoor lunch with Adam, Alexandra notices the torn-shirted man staring at her again, and the filmmakers show their faces dissolving into each other with lightning in the background. Could this bearded man be the killer? What is his link with Alexandra? We do not find out yet, as the filmmakers cut to an action scene involving Ty, who catches some bikers acting rowdy in one of the motel rooms. After he is kicked out of the motel room, in order to get the bikers’ attention, he pushes over one of their motorcycles. They immediately emerge from the motel room, apparently having sensed the motorcycle’s distress, as the door was closed, the curtains were closed, and the falling motorcycle made no sound. 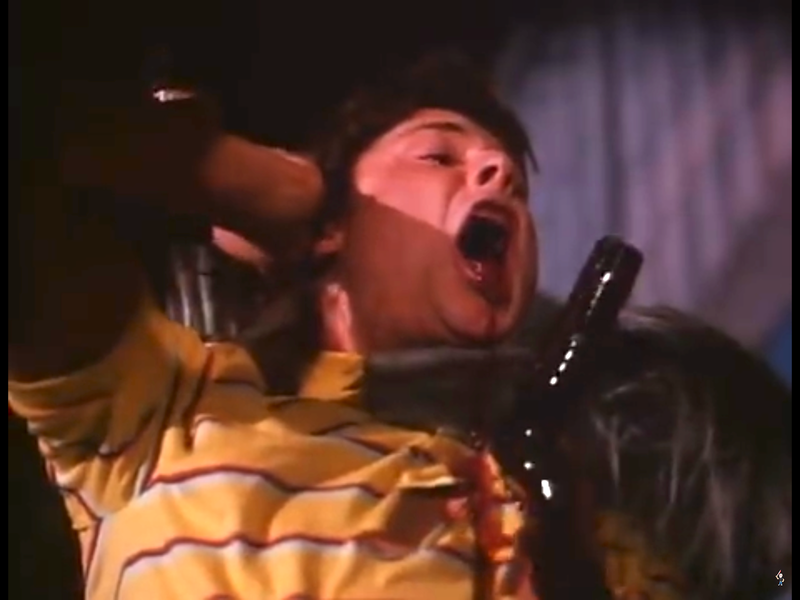 In a scene reminiscent of the kung fu magician in Demon Wind (1990), Ty catches a beer bottle that is thrown at him. He empties it on the fallen motorcycle, then handily kickboxes the three bikers into submission. “And a long leash,” adds Alexandra, somewhat confusingly. Back at the motel, Ty and his jokester friends investigate a mysterious room. They find a bedside drawer full of maggoty meat. They scramble out of the room, but they have left a sign of their incursion: Kato Kaelin has stolen an old book from the room, in the process dropping a yellow bookmark. Seconds later, the torn-shirted man enters the room and finds the bookmark. Their escape from the mysterious room leads to a comical scene between Kato Kaelin and Aldo Ray. Mr. Ray says, “I got something to show you guys that’s gonna make algae eaters obsolete.” He shows them a toy frog with a magnet that can help clean fish tanks. At this point, the torn-shirted man—not a red herring, as we might have suspected—transforms into a werewolf inside his motel room. He even howls at the moon, or rather the ceiling, for it is daytime and the moon is not out. For reasons that are not entirely clear, Mr. Kaelin decides to sing a song from the book to his girlfriend later, so he stuffs the book into his pocket and leaves the motel. Meanwhile, Alexandra and Adam are having something of a tryst at his house. She begins to impart a clue to the sheriff: “You know, I passed Jim Riley on the road the night I came home” (Jim Riley being the murdered old prospector in the pickup). They kiss, as anyone would in their situation. After the sun goes down, Mr. Kaelin walks along a deserted alley, presumably intending to meet his girlfriend. In an extended suspense sequence, Mr. Kaelin, who is carrying a long metal pipe, hears a noise. 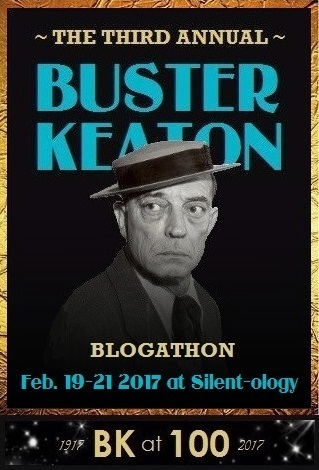 “I’ve got a pipe,” he says to whoever may be stalking him. “I’ll use it,” he mumbles. In slow motion, a werewolf attacks Mr. Kaelin from behind and impales him with his own pipe. The book falls out of his pocket and the werewolf picks it up. Later, Alexandra and Ty arrive at the scene of the murder. She comforts her brother by pressing his face against her chest. For a long time. After the murder, Ty is under suspicion, not least because of his Freddy Krueger glove, which would be capable of creating knife-like wounds. Ty shows the police the mysterious motel room where the actual werewolf was hiding out, but Alta says the room has not been rented in months. It looks bad for our kickboxing prankster, so he does what he does best: kickboxes a deputy and steals a motorcycle. The result is a thrilling chase through the deserted downtown of Danford. Ty races back toward the alley where Mr. Kaelin was murdered in order to save his other prankster friend. Unfortunately for Ty, the chase ends when his motorcycle bumps against the edge of a police car, throwing Ty to the ground. 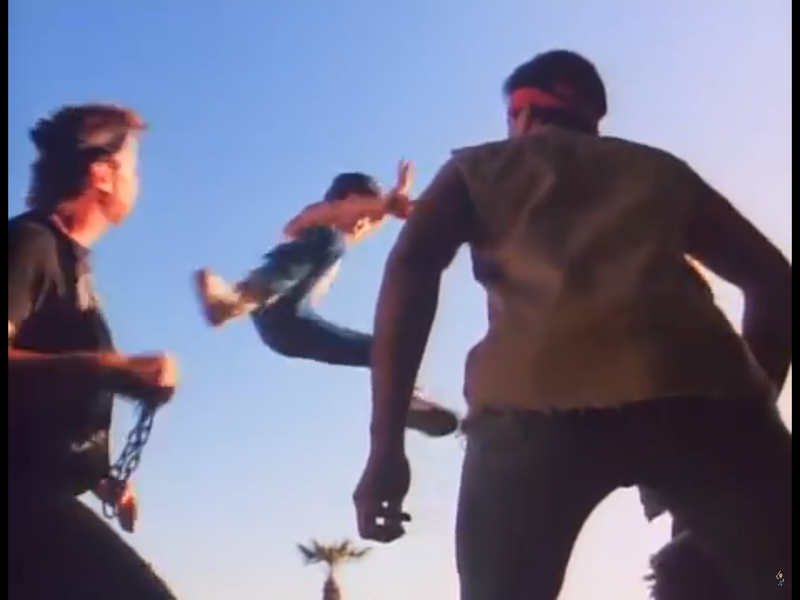 Fortunately for moviegoers everywhere, the filmmakers include three angles of the stunt, and we view Ty flipping off his motorcycle three times in a row. The deputy, for no evident reason, forces Ty to handcuff himself to the police car’s mirror. The deputy says, “I’m not here to fight you.” Then he punches Ty in the face. The deputy investigates the building in which the second prankster friend was assaulted by the werewolf. 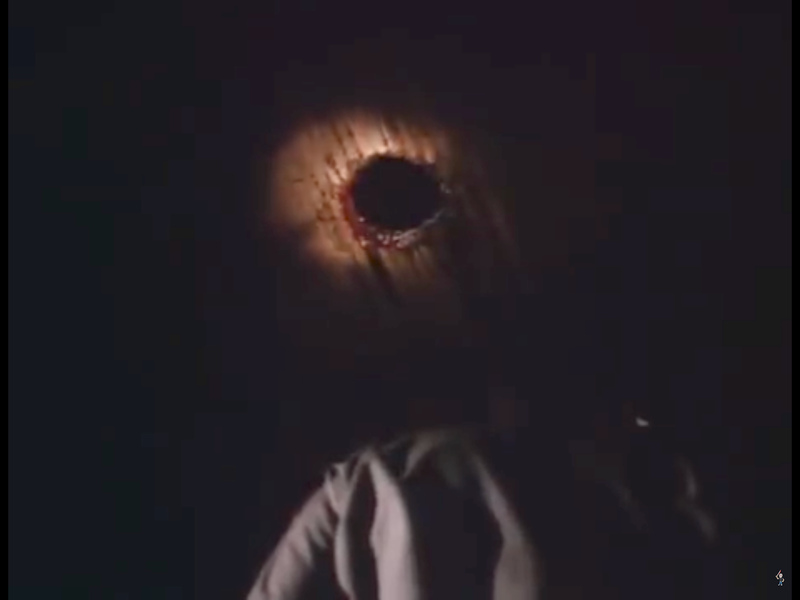 In perhaps the film’s most fascinating image, the deputy aims his flashlight at the ceiling, only to find a very bloody, very round hole. Of course, the deputy climbs up to the next floor, only to find the werewolf feeding on the prankster’s body. The deputy is quickly murdered. Playing against expectations, the filmmakers have Alexandra and Adam find Ty cuffed to the police car. Instead of freeing Ty, Adam wipes his forehead, while Alexandra walks into the building where the werewolf waits. Soon the werewolf confronts both Adam and Alexandra, neither of whom is at all surprised to see a werewolf. The lightning-infused connection between Alexandra and the werewolf becomes slightly more clear as Alexandra faints. “I am the Dane, and I am come for you,” echoes Mr. Kaelin’s voiceover, implying the werewolf has come to town to find Alexandra. Also, though he is cuffed to the outside of the police car, Ty manages to drive the car through a brick wall and pin the werewolf against the far wall. A well-placed gunshot makes the police car explode, which we see three times for good measure. 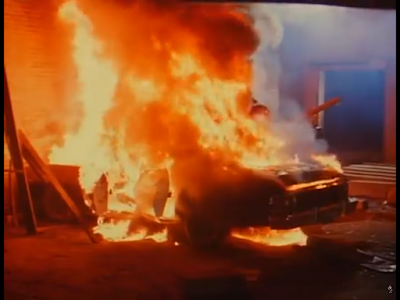 The image of the burning car is almost enough to convince us to forget that the villain of the film was not in fact the police car but the werewolf, whom we do not see as the car is burning. 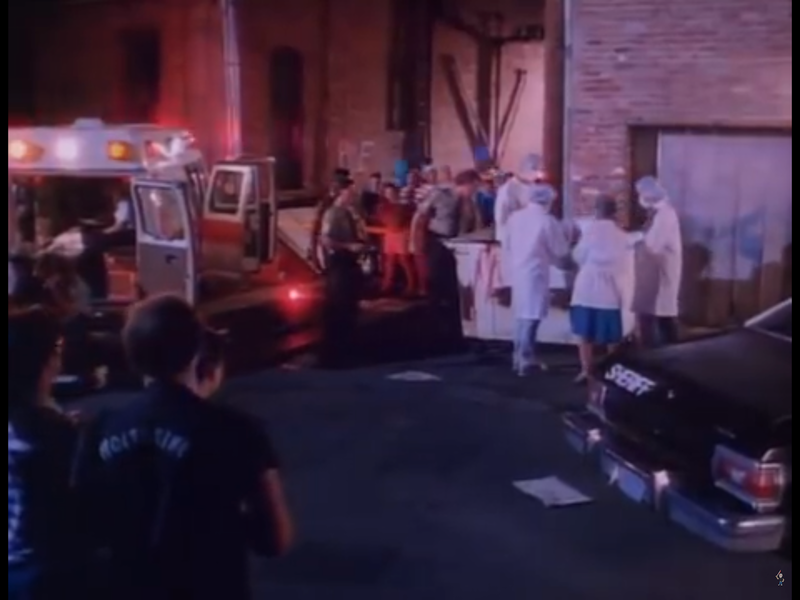 Happy music, however, convinces us that the werewolf must be gone, as does the finale in which Ty is taken away in an ambulance, Alexandra kisses Adam, and the credits start to roll. Night Shadow is not a proverbial "perfect film," as it has a small number of flaws. For example, the great Aldo Ray is present in only two short scenes. For another example, the less great Kato Kaelin is present in more than two short scenes. Additionally, the Roman numeral in the copyright year is MCMXLXXXIX, which is not a number. These are the only flaws I have identified in this fine film. While to some viewers the film might appear fast-paced and full of action, it should actually be appreciated for its subtlety and zen-like calm. 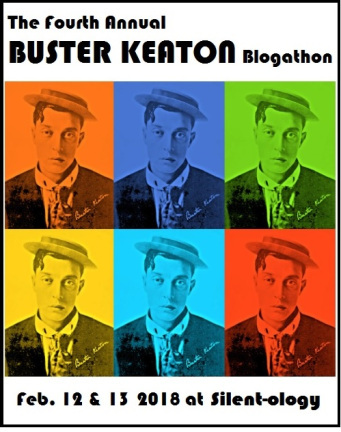 Everything is underplayed skillfully by the actors--with the possible exception of the cream pie in the fridge incident near the beginning. Emotions are realistically portrayed by the actors, who softly mumble most of their dialogue. Relationships are described succinctly and passionlessly, again to realistic effect. 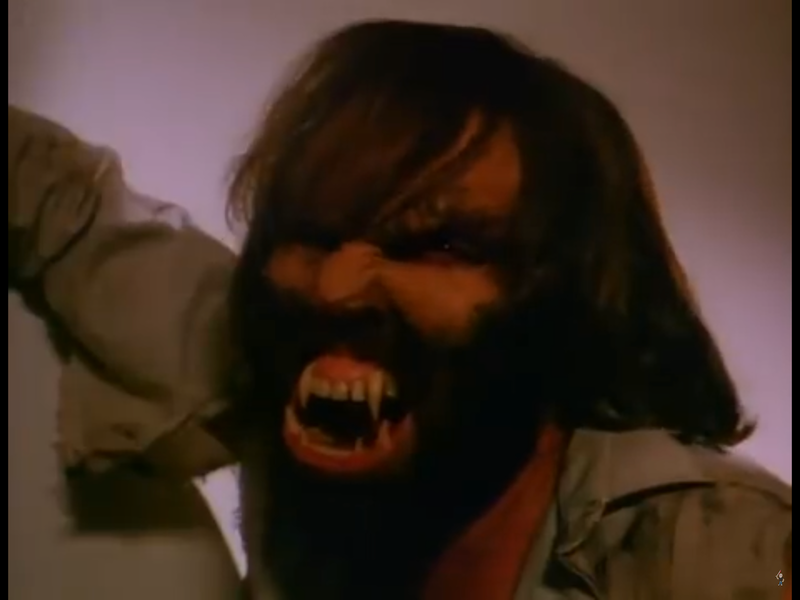 The director and actors should be commended for such a sober, unemotional approach to the werewolf film. Even the central mystery of the film is breezed over. The meaning of the phrase "I am the Dane and I have come for you" is never explained. 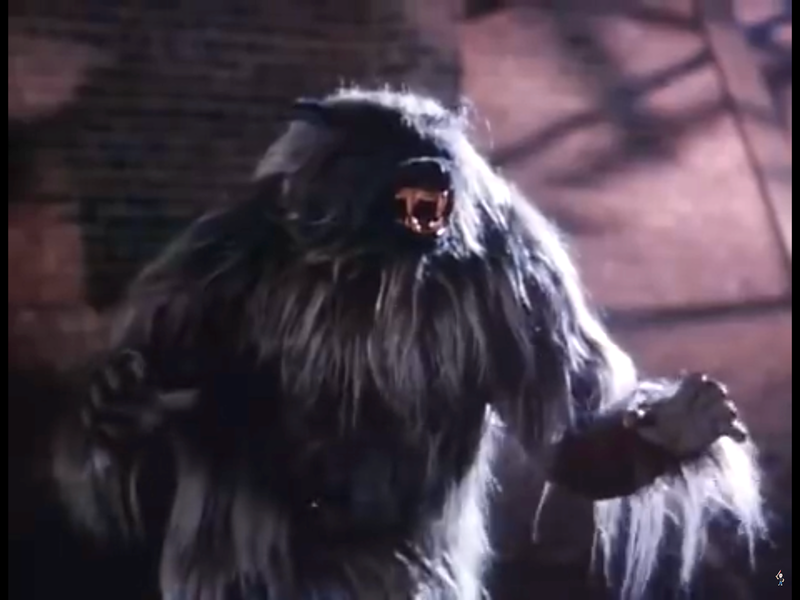 Perhaps the Dane is the werewolf, which would make some sense, as the monster looks a little like a Great Dane. Or perhaps there is some other explanation. The beauty of the film is that we will never, ever know. Ever. One last tidbit: The name of Kato Kaelin's character is Dean Lesher. 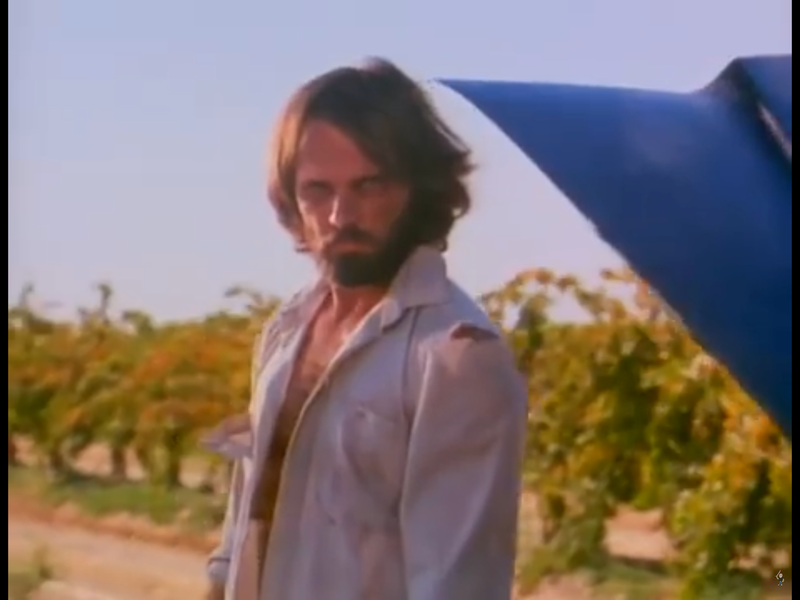 Perhaps the filmmakers were inspired by someone with a similar name: the great producer and actor Dean Lerner. Again, this is something that we will never, ever know. Ever.